2 Peel the potatoes and cut into wedges. Mix the potatoes with 2 tablespoons of oil and spread on a lined baking sheet. Bake for about 20 minutes, turning periodically. 3 Rinse the leeks and cut into rings. Rinse the pears, quarter, remove the core and cut into wedges. 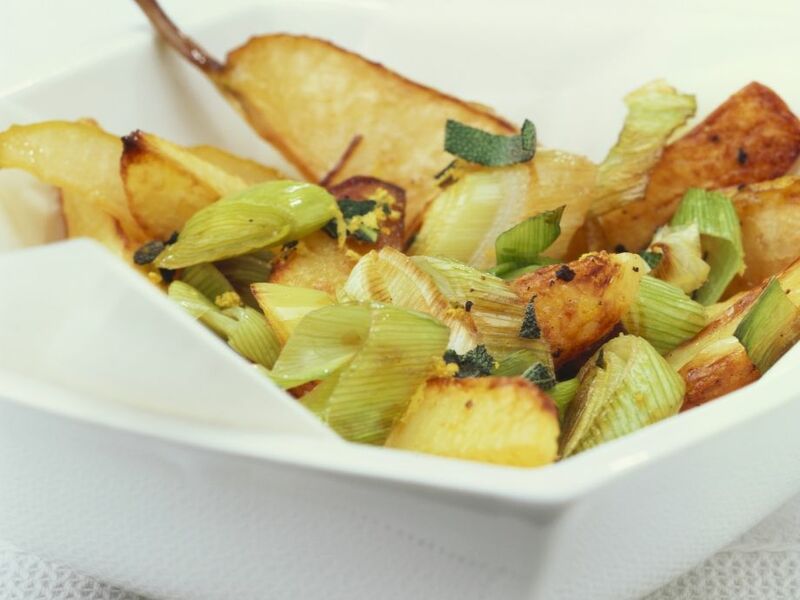 Drizzle the leek and pears with the remaining oil and mix with the potatoes. Season with sea salt. Bake for 10-15 minutes, until golden brown. 4 Zest a lemon and squeeze the juice. Add the lemon zest and honey to the vegetables. Season with lemon juice and pepper. Serve immediately.